MINALABAC, Camarines Sur—Investigators are now considering the possibility that Engineer Ferdinand Aquino’s disappearance is voluntary. Aquino, who has been missing since the middle of July this year, has not turned up despite the joint efforts of his family, the police, and the media in the search. The engineer, who is an employee of the local government unit of Minalabac, left home on July 12. 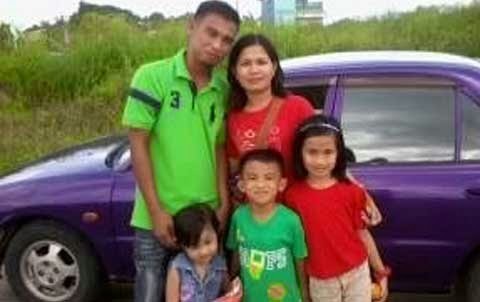 But his wife, Mercy Valencia Aquino, has not lost hope. In an interview by BICOL STANDARD, Mrs. Aquino said that she believes her husband is still alive. On her Facebook account, she continues to post messages that she hopes her husband would be able to read. “Wherever u r ryt now, i just want 2 let u know that our 3 kids r always looking 4 u,” she posted. Her desperation is growing as the mother of three is now only days away from giving birth to their fourth child. “Another one bb girl is soon 2 be born frm my womb and im sure she wil also be looking 4 her father... In case ur still here, pls let us know, ur family deserves peace of mind... And ur kids deserve ur love and protection... Or at least they know that they still have their “PAPA,” she said. Mrs. Aquino told BICOL STANDARD that she has spent the last few months trying to trace the whereabouts of her husband, but stopped as the date of her delivery drew near. Despite her faith that her husband will show up soon, she said she is no longer interested in whether he would want her back.